The Arduino is a small board which features a programmable microprocessor and several pins you can use to interact with the world. What does that mean to you? It’s a cool way to write programs which affect the physical world. In this tutorial, we’ll play with some neat lights and see how the programming instructions affect what you observe. An LED is a small light with two wires. When one side is connected to a positive electrical source and the other to negative (or "ground"), the LED lights up. These are not dangerous. The electrical voltage we’re using here is so low that even if you intentionally tried to electrocute yourself, you probably couldn’t even feel it. Don’t be concerned. The led has two stiff wires that we’d prefer not to bend. The shorter one goes to the ground or negative line – this is called the "cathode". 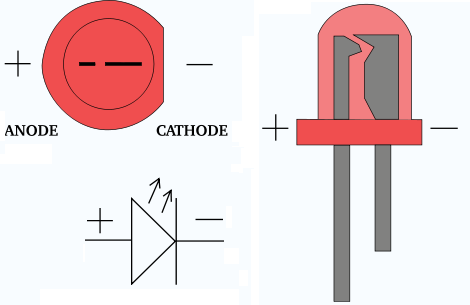 The other, longer pin, goes to the positive line – this is called the "anode". Let’s build a simple circuit that involves no programming, just wiring. Connect the USB cord to your computer and the Arduino. You should see the small green "ON" led light up on the board. Put one end of the red wire into the hole on the Arduino marked 5V. Put the other end of the red wire into any hole in the "+" column on the left side of the breadboard. Put the green wire into the hole on the Arduino labeled "13"
Put the other end of the green wire into row "2" column "e" on the breadboard. Put the wire coming out of the resistor’s orange-banded side into any of the holes in the "-" column that the black wire is connected to. Put the LED’s long, positive, wire into row "2" column "c"
Put the LED’s short, negative, wire into row "3" column "c"
The flat side of the LED should be facing row 3. To be in command of this light, we’ll need to write a program that interacts with the Arduino. We’ll need some software that can talk to it. And we’ll write some files to tell it what to do. Lets set those up now. We can write programs to interact with our Arduino, controlling LEDs and reading from sensors. If you buy extra parts, you can even control motors to make things move. Let’s start by downloading the Arduino software that will allow your computer to push code to the Arduino. Visit http://www.arduino.cc/en/Main/software and click on the download link for your operating system. We need to connect the software to our Arduino. Tell it what kind of Arduino we have by going to "Tools" and then "Board" and selecting "Arduino Uno". We’ll make a new folder to store the files we use for this tutorial. This can be done in a command prompt by typing mkdir community_night_arduino and then moving into that directory with cd community_night_arduino. Where to make this folder is up to you. Everything we do on the command line, we’ll do in this directory. Thanks to a gem (a collection of Ruby code) written by Austin Vance we can use Ruby to interact with our Arduino. It doesn’t need to be exactly the same. The important thing is that you don’t see any errors. We need to load a "bootstrap" program onto the Arduino board that will let us manipulate it from Ruby. This will create a folder named "du". If you previously moved the green wire from hole "13" to the "+" column to see the LED turn on, then move it back to hole "13" now. We need to tell the software to give us information about what it is doing. Go to the "Preferences" dialog and check the boxes for "verbose" output during "compilation" and "uploading"
Open the .../du/du.ino file in the Arduino software. In the file window, at the top left, click the right-arrow-in-a-circle button for "Upload"
If you see "avrdude done. Thank you." then you can skip the rest of these instructions. Then when we upload code, it is interfering with the code that was previously loaded onto the board. We can press the "RESET" button on the Arduino as soon as we see "Overriding Baud Rate". This will allow it to accept the program we are uploading. It will inform you that the program is from an unidentified developer, which basically means that Apple hasn’t vetted the software as it has with programs we install in the App Store. Click "Open" to acknowledge this and continue installing. Accept the default install settings and progress through the wizard. Restart the Arduino software to get it to use the new drivers. (Mine still had the same issue for a few minutes after restarting). You’ll see a lot more output this time, concluding in "avrdude done. Thank you." Let’s try out a very small program and see if we can observe a reaction from the Arduino. In your command prompt window you should see "on" and "off" printing out over and over. Look at the Arduino board, and you should see a small LED next to pin 13 turning on for one second, then off for one second. Additionally, we should see the LED blinking! Hold down Ctrl and press c to stop the program. Move the green wire from pin 13 to pin 11. What happens? Stop your Ruby program and go look at the source code. What change change to the code might get the LED blinking again? Try it out! Now let’s make the LED blink faster. How can you make it blink on for one tenth of a second, then off for one tenth of a second? Add a second LED to your breadboard connected to pin 10 of the Arduino. Make it blink at the same time as the first LED. With the connection made to the Arduino, we can do some neat experiments on the Ruby side and see how they affect the board/LED. Let’s create a number guessing game. When the program is running, you can type any of the numbers 0 through 9. If the number is too small, the lower LED will blink twice. If the number is too big, the upper LED will blink twice. If the guess is correct, both numbers blink twice. We’ll build this up piece by piece. So that’s basically all setup stuff that we can leave alone. Below those four lines is where we’ll write the logic of our game. The first line uses the cycle method to repeatedly run the block with each value in the array. The first time, :on gets put into the variable switch, then runds the three lines inside the block. Then it goes back up, stores :off into the variable switch, and runs the three lines again. Then this loop repeats over and over. In our game we want to be able to easily blink the LEDs one or two times. Let’s write a ruby method that can wrap those instructions up into a single instruction. That method expects us to pass in an argument that is a LED object, then it’ll turn the LED on, wait 0.1 seconds, then turn the LED off. Your lower LED should blink on exactly twenty times then your program should exit. Can you modify our Ruby script so that the blinking goes like this? And repeat that cycle five times. After you make it work and get it checked, delete this loop. Run the same instruction 10 more times (use your up arrow to avoid retyping it). What numbers do you get? What number do you not get that you might have expected? What’s the lowest number you get? How many possible numbers are there? What instruction would you use to generate all the numbers zero through ten? Write an instruction in your Ruby file to generate a secret number and store it into a variable named secret. Although we really want to use the LED, at first let’s just use text in Ruby to handle and react to the guessing. Your secret is an integer, but gets.chomp is giving you a string (a piece of text in Ruby is called a string). Convert the string to an integer before comparing them (some_string.to_i). until (condition)…end will run the block defined between do and a matching end until the condition is true. Try it out and squash bugs until this version of your game works. Run it several times to make sure it’s working! Let’s add in more information about why the guess is wrong. Verify that this works and get your work checked. If your last version worked, let’s now replace the too high or too low messages with the LED blinks. On the computer you should see no feedback from the guessing other than the request to type in a next guess. What happens when you guess correctly? So far it just exits. Let’s celbrate. Write a method named celebrate that blinks both LEDs together three times. prints out a line like "You correctly guessed the secret was 6"
It’ll take some experimenting. When it works, get it checked. Try an have someone else play your game! When it works, have someone else play and get it checked. Limit the game to only 15 guesses. If they don’t get it in 10, just quit with no blinks. If they guess the number, celebrate should blink the number of chances they had left. Add a third LED. Each time they guess, blink it with how many guesses they have left. LEDs are pretty cool, but let’s try an experiment with an analog sensor. A digital signal, like we’ve been using so far, is either on or off. It’s like a normal light switch. But an analog signal can have many points inbetween. It’s like a dimmer light switch. It could be full on, full off, or anywhere in between. This sensor can be used to measure light. When electricity is flowing through a circuit it encounters resistance. The LEDs we’ve used were adding resistance to the circuit and they consumed some of the power. If we change the resistance in a circuit we change how quickly electricity can flow. Increasing the resistance in a circuit would cause it’s lights to be more dim. The light sensor works by creating resistance in response to light. When there is a lot of light, it creates a lot of resistance. When it’s dark, there’s very little resistance. We can measure the resistance going through the light sensor and get that data back to our Ruby program. Let’s build a nightlight using our Arduino. When there’s normal light on the circuit, the LED is off. When it gets darker, the LED turns on. Understanding how/why the circuit works takes a bit more electical knowledge than we want to get into right now. Instead, let’s build it and experiment. If you’ve completed the game above, leave that circuit in place. If you didn’t, wire up the LEDs following those earlier instructions. Turn the breadboard so the LED wiring is at the bottom left of your view. Put a blue wire into the top left pin of the breadboard. Put one side of the light sensor into the pin two holes to the right of the blue wire. Put the other side of the light sensor into the pin two holes to the right and one pin down from the blue wire. Put the resistor so that one end is in the same row as the white wire, one pin to the right of the light sensor. Put the other end of the resistor in the same row but across the "well" – the right side of the breadboard. Put a green wire in the pin one to the right of the right side of the resistor into the 5V pin on the Arduino. We need a Ruby program to see if it’s working. You should see a bunch of numbers scrolling by, mine says 62. Cover the light sensor with your hand and the number should jump up to over 150 – mine went to 182. If you’re seeing numbers around 0 or 1000 there are problems with your circuit. Go up and work through the instructions again. The code between the do and end gets run each time the Arduino measures the sensor, several times per second. The variable data is the numeric reading. We saw that when the circuit is not covered, data was around 62. When it’s covered, data goes up to about 182. If it is higher than a certain number, print "It’s dark"
If it is lower than the number, print "It’s light"
Watch out that data is a string. You probably want to convert it to an integer. Look back at your first project to remember the instructions for connecting to and turning on an LED. See if you can make it work. When it’s working, remove the puts lines from your Ruby so it just runs and changes the light without any text output. Have someone verify your work. Have you ever noticed how some cell phones actually get dimmer the darker it is outside? When it’s really dark, you don’t want a super bright light or it’s hard to see anything else! Maybe your light shouldn’t be so quick to turn off when exposed to light. Make it so when the outside light goes down, the LED(s) turn on instantly. But, when the outside light increases, the LEDs stay on for five seconds.